Ah, we meet again Mr Dickens. 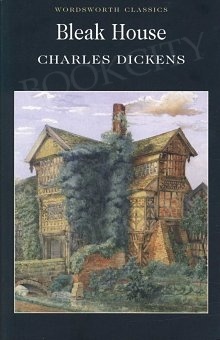 I'm pretty sure this is the last Dickens currently in my collection that I had yet to read, and I was curious to see what end of the scale it would fall for me. Would I love it like I did Our Mutual Friend or would it be another drag like The Pickwick Papers? Bleak House is something of a difficult novel to summarise, but I'll be giving it a damn good go. The novel ultimately centres around two major plot elements. The first is an ongoing lawsuit named Jarndyce vs Jarndyce, a will dispute that has been carrying on for so long that no-one has any idea what the actual case involves anymore, and the people who are sucked into the whole grim process. The second is a secret kept by one Lady Honoria Dedlock and the attempts that are made to uncover it. Other smaller plots are related at certain points during the novel, but those are the two that inform most of the motivations for other characters and the other plot lines would take so much setting up that I might just as well copy and paste the entire novel into this review. Which would be cumbersome at best. The story is told via two narrators: Esther Summerson, a ward of the chief suitor involved in Jarndyce vs Jarndyce, and an anonymous narrator who takes a largely pessimistic viewpoint to contrast Esther's overall optimism. Like Our Mutual Friend, the novel takes a look at corrupting influences within society, with Bleak House concentrating on the labyrinthine bureaucracy of the Law and the harmful effects of misplaced or self-serving charity. To hear some people talk, you would think that this is a novel so dense and complex with its interweaving plotlines that it would be impossible to follow. And while I will grant that it is very dense and complex, it is told in such a way that I at least managed to follow the narrative with relative ease. A large part of this is down to the cast, which is vast and the majority of them are important several times over because of the surprising number of connections that there are between characters of all social backgrounds. I was personally rather mixed about these connections. On the one hand, it does mean that the plot is richer and more layered because one character can embody several different roles depending on who the viewpoint character of the moment is. On the other hand, it is awfully convenient that this character just so happens to be, for example, another character's long lost mother and will be key in getting him re-established in the world. Sometimes these connections will just sort of pop up without much in the way of prior establishment and it does sort of drag you out of the narrative because of the obvious nature of it. On balance, the good outweighs the bad points, but it can be quite distracting at times. Many of the good points that I can recommend this for will be quite familiar if you've already read my review of Our Mutual Friend: Dickens seems far more comfortable as a writer when he is tackling social issues, which in this case is largely failings of the law. More interesting to me though was the examples of bad charity, as it were. It's interesting to contrast what I termed above as misplaced and self-serving charity. In regards to the former, it is presented as a flaw, but an understandable one: if you're a good-hearted person who wants to help someone, it can be hard to see when you're doing more harm than good because the person you're helping just isn't or can't learn to change their self-harming ways. The latter is presented more curiously, as it is seen solely in characters who could be seen as full-time philanthropists. These are characters who have devoted themselves to a cause, and in pursuing that cause they inadvertently cause more harm than good. An example of this is when one of these philanthropists, Mrs Pardiggle, visits a brickmaker's house whilst accompanied by her sullen, downtrodden children. She essentially marches into their house at will, leaves leaflets that none of the people there can read, preaches at them for longer than anyone would wish, and then leaves, completely missing the traumatised woman holding her stillborn child in the process. It was a passage that really stuck with me, as it reflects a tactic that a lot of people will still use today. The tactic argues that "charity is good, so if I am seen to be charitable then I am a good person". It doesn't take into account either how that contribution to charity is implemented in the real world context or how the charitable person acts to people in direct proximity to them. You don't tend to see much critical analysis of our culture of charity and the perception that we as a society has of charity, so quite frankly I would recommend Bleak House just for that dialogue.